I have been searching and searching for a good ice cream recipe that didn’t require cooking. The problem with cooked ice cream recipes is that they take way too long to actually get to ice cream. When it is 7:00 in the evening and I think, “Hmmm, I want ice cream” that doesn’t mean I want ice cream tomorrow. I want ice cream right now! This recipe is super easy and rivals anything you’ll get from Ben and Jerry’s. I think it’s going to be a while before Miss Lily gets to have this particular kind of ice cream again! The adults will be having this again very soon. You don’t need an ice cream maker to make this ice cream, but it sure helps. We could make this ice cream in about 30 minutes, which is completely do-able if you want ice cream right now. Combine milk, sugar, espresso and cocoa powders until sugar is fully dissolved (I used the whisk attachment for my Kitchen Aid mixer). Stir in cream and vanilla. If using your mixer, mix slowly until the mixture is combined. Don’t whisk on high or you’ll end up whipping it. Place in your ice cream maker per the manufacturer’s instructions. Once the mixture is done, add the crushed cookies or Heath bar and combine. This will give you a soft ice cream. 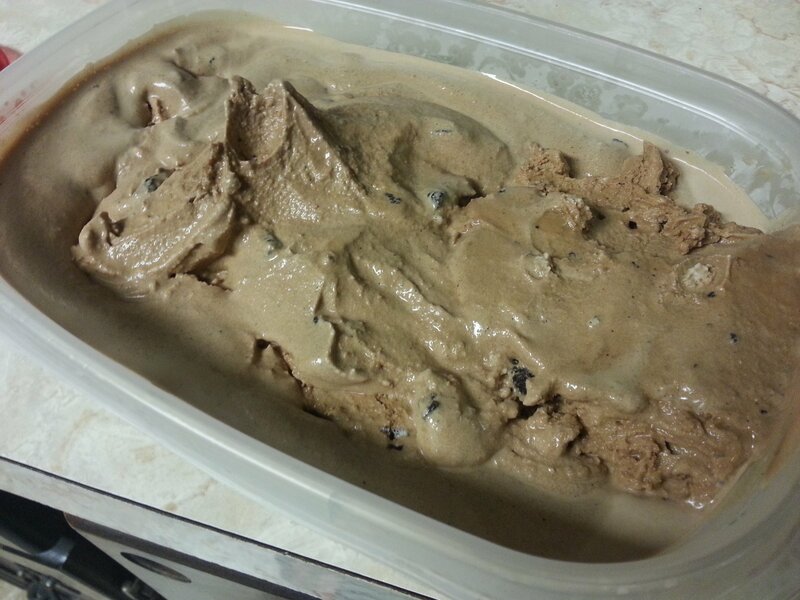 If you want hard ice cream, just freeze the mixture for an hour or two in a plastic or Pyrex container. If you don’t have an ice cream machine, poor the mixture into a plastic or Pyrex container and place in the freezer. Once an hour, stir the mixture to avoid large ice crystals. After two to three hours, you should have soft serve consistency. Add the cookies or candy. You can freeze to hard ice cream by leaving the ice cream in the freezer for an additional hour or two.